Hotel Surya which was established in the year 1983 is located just a kilometer away from the railway station. 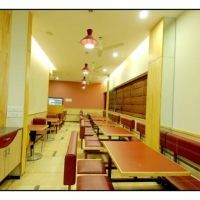 The hotel also has a restaurant to satiate your taste-buds and 45 well appointed rooms to match the tastes of myriad variety of customers, both local and non-local people and foreign tourists. There is also an A/c conference hall with a sitting capacity of 150 members. Property Location Located in Mangalore, Hotel Kumars International is convenient to Manjunatha Temple and Mangala Stadium. Rooms Make yourself at home in one of the 36 air-conditioned guestrooms. Wireless Internet access (surcharge) keeps you connected, and cable programming is available for your entertainment. Conveniences include direct-dial phones and desks, and you can also request irons/ironing boards. Dining You can enjoy a meal at a restaurant serving the guests of Hotel Kumars International, or find a snack in a coffee shop/café. Business, Other Amenities Featured amenities include dry cleaning/laundry services, laundry facilities, and a safe deposit box at the front desk. Located in the heart of the modern city Mangalore, Megha Residency is a perfect stay option for business as well as leisure travellers. One of the finest hotels in the city boasts of 37 well-furnished rooms spread across four floors. The hotel also has a fine dining outlet serving culinary delights to its diners and extensive business conference hall to make for an ideal venue for seminars and conference.